It has been the most glorious day here in North Wales today! Blazing hot sunshine, beautiful blue skies and a lovely warm breeze to stop you getting too hot and sticky. Unfortunately I haven’t really been able take advantage of this heavenly weather, other than a quick whizz around the park with the dogs, because my poor, fourteen year old son has both legs in plaster up to the knee. Needless to say I can’t leave him for too long unless he has someone with him. Ben suffers from Chronic Pain Syndrome and is an idiopathic toe- walker which exacerbates the pain. He is physically unable to put his heels to the floor hence both legs being in plaster. It is a very crude and I would go so far as to say barbaric method by which the legs are forced into the correct position and then plastered very quickly. The tendons are forced to stretch and so will lower the heel. It is a very painful process for him and very tiring for us both. At 14 he is 6 inches taller than me (not difficult as I’m only 5 foot 2!) and a big lad. Unfortunately we have hardwood floors or quarry tiles throughout the ground floor and three boisterous whippets! It is rather like watching Bambi on ice with 3 very unhelpful Thumpers! The upside to being stuck in the house is that I can experiment in the kitchen. This recipe was one that I really fancied playing with. I first came across it on one of the rare occasions that my previous career as a high school teacher and my current career collided. I was asked by my son’s cookery teacher to run a sugarcraft workshop for a group of Year 10 pupils from several local schools and then to stay on a mentor /judge a “Master Chef” competition with the same pupils later that day. The level of skill these 15-year-old kids had was truly astounding. One young man even made his own puff pastry from scratch just because he could! One pupil, however, caught my attention with her cheesecake recipe. Firstly she used one of my favourite ingredients, condensed milk, then she simply added cream cheese and lime juice to it! I admit I was very dubious but I have to say it was gorgeous! This recipe uses lemon juice instead of lime and since I have a bit of a thing for lemon and ginger together, I thought I would use gingernut biscuits to make the base. The added bit of zing is provided by a light topping of my homemade lemon curd. Mix the biscuit crumbs and melted butter together. Tip into a 20cm loose bottomed, Springform tin. Press the mixture down firmly then chill in the fridge for 10 minutes. 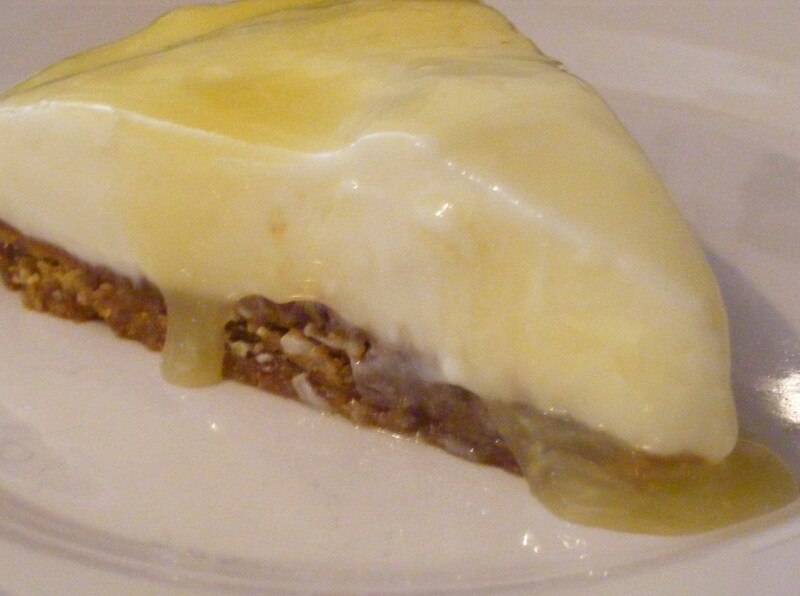 Pour the condensed milk into a mixing bowl, beat in the cream cheese then add the lemon juice. Pour the mixture onto the biscuit base and level it. 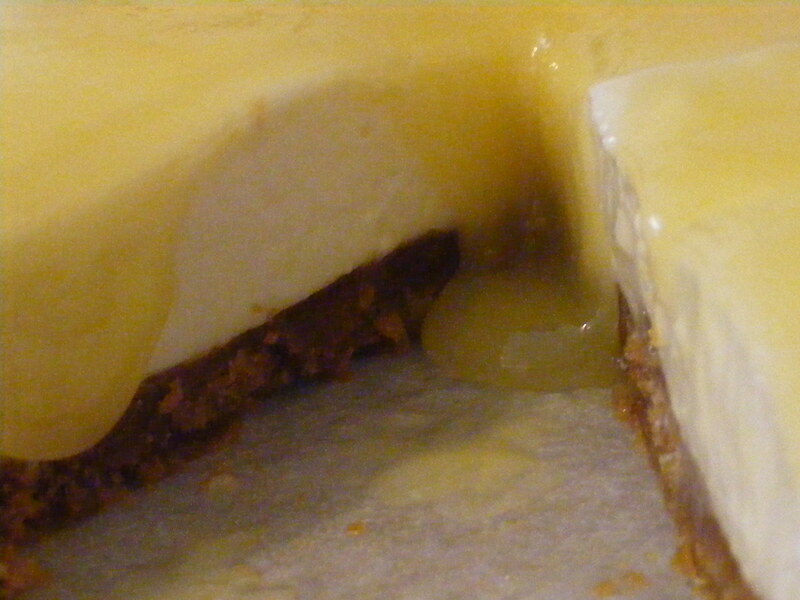 Spoon over the lemon curd and spread it across the top of the cake. OK, so I might have overdone it a little with the lemon curd but it is absolutely heavenly! You could simply dot a few blobs of lemon curd on instead or simply grate a bit of lemon zest on the top but I do love my lemon curd! This sounds lovely, i will try it. What does the tinned milk do? Often wondered, is it a thickening agent? It reacts with the citric acid in the lemon juice and helps the cake to set. It really is a stupidly easy cheesecake to make. Enjoy!